Home > News > Uncategorized > Are you a Maxilead Member? Do you know about the Cash Ban? For people who weigh in regularly, you will be aware of a new law that has come into place. As of the 9th May 2012 it is a legal requirement to take photo id of any persons disposing of scrap and of 3rd December 2012 it is illegal to buy scrap metal for cash. By using this card everytime you weigh in you will be trading your scrap metal legally and in the easiest way!! Another added benefit of having a members card, is that we can guarantee the best possible prices on all grades. Its our way of saying thanks!! 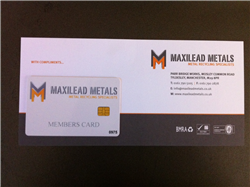 So make sure next time you have any scrap metal to weigh in, come to Maxilead Metals and become part of the Members Club! ← Red Dukes going to Dubai!